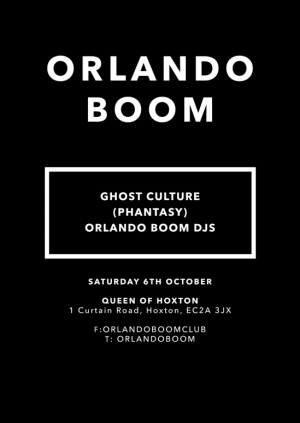 Orlando Boom are very pleased to welcome Phantasy main stay, and good friend Ghost Culture, with writing credits on the Daniel Avery album, a critically acclaimed album of his own an brand new 12" about to drop on Erol Alkan's Phantasy imprint. Its fair to say Ghost Culture slides right into our niche. Expect an extended sprawling DJ set from one of the UKs finest electronic music producers.